Many countries are already working on greenhouse gas (GHG) mitigation strategies. One reason is that they regard climate change as a major risk for our planet. Concentrations of carbon dioxide (CO2) in the atmosphere reached 400 parts per million (ppm) in 2013 and are approaching the 450 ppm limit. The impact on the climate could be irreversible. Another reason is that countries believe that green technologies could boost economic growth by creating new industries, businesses, and jobs. But the most important question that is being overlooked in some countries is how to implement mitigation and adaptation strategies without jeopardizing economic development or the competitiveness of national industries. The European Union has established aggressive GHG-reduction regulations and has invested massively in renewable energies. From 2000 through 2013, the EU added more than 80 gigawatts of solar photovoltaic power capacity and 100 gigawatts of wind power capacity. The good news is that GHG emissions have dropped from 4.7 gigatons (Gt) in 2010 to 4.5 Gt in 2012. 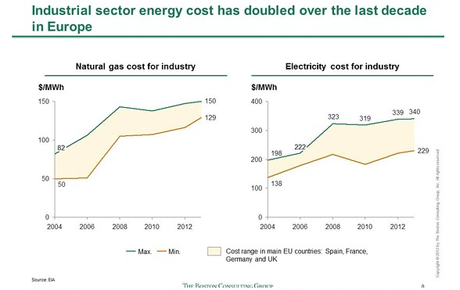 The bad news is that energy prices in the EU have doubled in the past decade, putting European industry at risk. 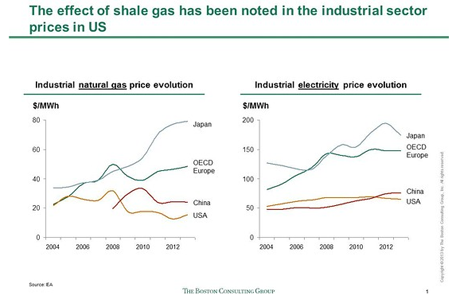 The U.S. has supported the development of shale gas, which has made the nation less dependent on imported energy, has reduced CO2 emissions, and has dramatically cut industry’s energy costs. Energy costs for industry in the U.S. are half those in the EU, enhancing the competitiveness of U.S. industry.